We would like to pause and thank God, for the history of an organism that has weathered the storm. We especially owe our gratitude to those pioneering Christians who had the courage and determination to keep the spiritual needs of their Christian belief a reality. Throughout the our existence of the church, we have had only a few pastors to guide us along the way. Over 112 years ago, the late Mr. Rose Ferguson and a few laboring personnel came to the Leesville community from Jasper, Texas with the Nona Mills Lumber Company. The people were provided a home by Mr. Ferguson, who named the settlement the Nona Mills Quarters, which is the present site of the Vernon Parish School Board, East Leesville Elementary, Leesville Jr. High School, Leesville High School and Leesville High School Stadium. These people were not only working for a living, but working for a life. They met in their homes and held church school and worship services. God provided, these “Anyhow Christians”, through Mr. Ferguson, with a plot of land, lumber and labor cost for a church building. 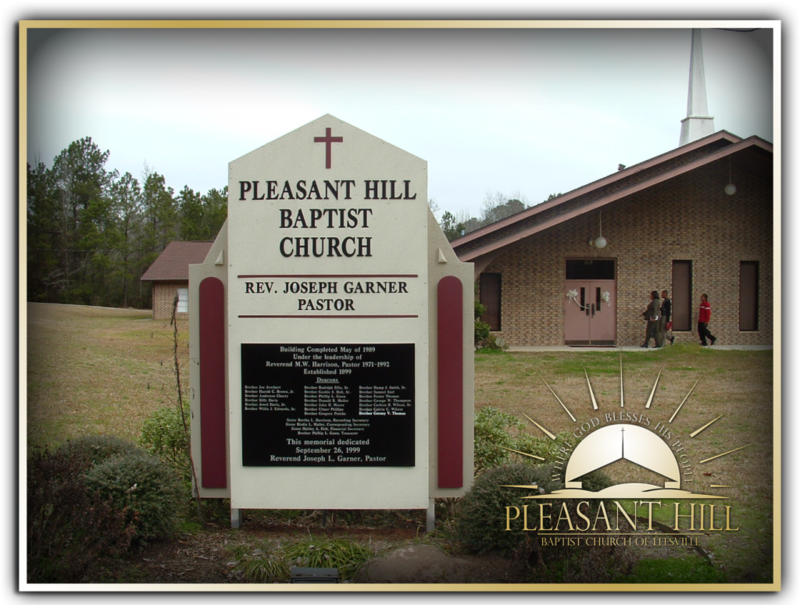 On September 1, 1899, God sanctioned the naming and dedication of the Pleasant Hill Baptist Church, the first African-American church in Leesville. From Pleasant Hill Baptist Church other churches in Leesville were organized such as the New Willow Baptist Church in 1900, the Mt. Olive Baptist Church in 1912 and the St Paul Baptist Church in 1925. 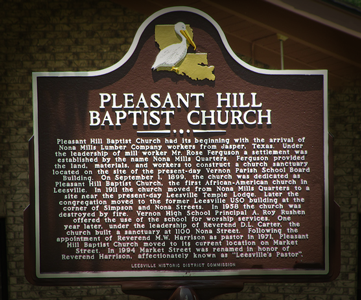 The location of Pleasant Hill was moved from the Nona Mills Quarters in 1911 to the site near the late brother Dan Mullen’s property, the present site of the Leesville Temple Lodge. Later, a move was made into the U.S.O. building that had been converted into a church, located at the corner of Simpson and Nona Street. On February 12, 1958, the location of the church and its contents was destroyed by fire. After our church burned, there was no place for worship, but God always provides a way for His children doesn’t he. Mr. A. Roy Rushen, then principal of Vernon High School, offered the use of the school for church services. The site at 1100 Nona Street was built in 1959 under the leadership of the late Reverend D.L. Carter, and less than 15 months after the church had burned the members were able to enter the new location. Reverend Carter was a good shepherd for his sheep and led us in the way of the Lord for 35 years. Later, his health failed him and he recommended a new pastor, Reverend Monroe W. Harrison, in 1971. Reverend Harrison was a deacon of the church and became an ordained minister in September of 1957. He preached his first sermon as full-time pastor on February 7, 1971. Throughout his 21 years as pastor of Pleasant Hill, Reverend Harrison exemplified exceptional abilities as a shepherd of the Christian flock. Because of his great pastoral ability, Reverend Harrison was commonly referred to as “Leesville’s Pastor”. While under the leadership of Reverend Harrison, the church moved to its current location at 1210 M.W. Harrison Street. M.W. Harrison Street was formerly known as Market Street, but was renamed in honor of Reverend Harrison on May 12, 1994. The church continued to grow spiritually, financially and numerically and this was one of the primary reasons for the relocation to our present site. On August 9, 1992, Reverend Harrison officially offered his resignation to the officers and members. After much prayer the Lord had placed on his heart, in a vision through the Holy Spirit to have Reverend Joseph L. Garner succeed him as pastor. The motion was offered and seconded and passed unanimously. The installation service for pastor-elect Garner was held on September 3, 1992 with Bishop Paul S. Morton, Sr., pastor of The Greater St. Stephen Full Gospel Baptist Church of New Orleans, LA conducting the service. Under the leadership of Pastor Garner, more that 2,592 new members have been added to the Pleasant Hill Baptist Church family and of that number, more than 844 have been candidates for baptism. We presently have three choirs (Cherub, Youth and Adult), two usher boards (Senior and Junior), Deacon and Deaconess Ministries, Men of Vision Ministry, Women’s Missionary Society, Ladies on the Move, a thriving Sunday School. Under the leadership of Pastor Garner, we have instituted several new ministries such as: a Praise team, Prison Ministry, Pastoral Support Ministry, Deacon Family Visitation Ministry, New Member Ministry, Senior Care Ministry, Hospitality Ministry, Media Ministry, a Praise Dance Ministry, Drill Team Ministry, Mime Ministry, Step Team, Health & Wellness Ministry and Street Beautification Ministry. We recently added families of Deployed Service Members Support Ministry, Drama Ministry, DIVA Ministry, Church Security Ministry, and Married Couple Ministry. We have also added to the annual program of the church an Annual Men Boy’s Outreach, Annual Women Girl’s Outreach, Annual New Members Banquet, Annual Women’s Conference, Annual Youth Week, Annual Family Day Weekend and the Annual Bayou Gospel Classic. Each year our Youth Drill Team and Praise Dancers march in the Southern University Homecoming Parade where they have consistently received first and second place awards. They also march in the Grambling State University Homecoming Parade and other smaller events. In keeping with the times, our church is also listed on the World Wide Web with a site designed, and constructed by Pastor Garner. Our church services can also be heard on 88.1 FM on Tuesdays at 11:00 a.m. and Sundays at 5:00 p.m. Pastor Garner is in the process of enabling our services to be viewed live on the internet. Truly the lord has blessed and continues to bless the Pleasant Hill Baptist Church. A Time Tested, God Ordained, Holy Spirit-Led Ministry for the New Millennium; The place where God blesses his people.